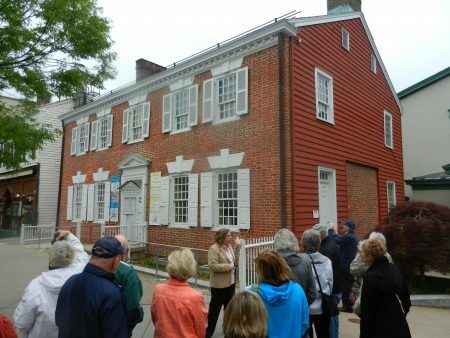 Enjoy a 2.5 hour walk around downtown Princeton and the University campus as you learn about historic sites in the area, including Bainbridge House, Nassau Hall, the University Chapel and Palmer Square. The early history of Princeton, the founding of the University and the American Revolution are just some of the stories from Princeton’s history that you will learn on your tour. Tickets are $7. Advance purchase is recommended, as space is limited. Walk up ticket sales are cash only; guides cannot provide change. PLEASE NOTE: Bainbridge House is undergoing renovations, partially obstructing the sidewalk. Walking tour groups may gather closer to the Garden Theatre. PARKING: As of November 5, 2018, new parking meters have been installed around Princeton. Meters are now enforced 7 days a week. Click here for more information. Free parking is available on weekends in Princeton University’s numbered lots. Lot 10, on William Street, is closest to the start of the Sunday walking tour. © Historical Society of Princeton® All rights reserved. Reproduction of any photographs, images or text without the express written approval of the Historical Society of Princeton is prohibited.